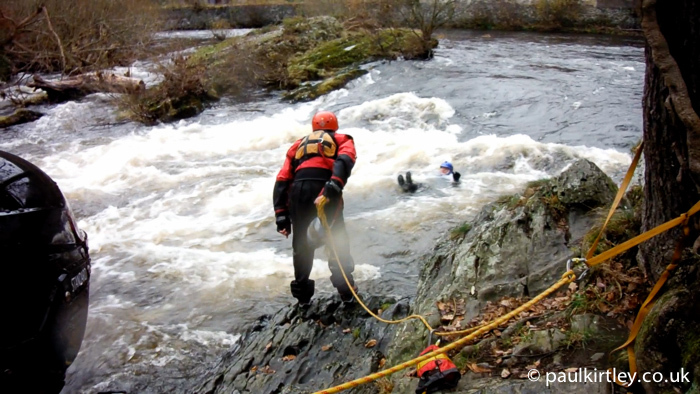 White water safety and rescue skills are essential if you spend any time on or near rivers. These are real world survival skills. If you examine the statistics relating what kills people outdoors, water is right up towards the top of the list. Another big killer is hypothermia. Clearly cold water is dangerous, whether it is moving or not. Moving water, whatever its temperature, poses specific hazards. Those who are operating on or in moving water should, of course, be well versed in safety and rescue skills. I also think they are valuable to anyone who goes near to water in any capacity, even as a walker. I didn’t learn these skills until I became a canoeist. But I had, for many years, been a hiker and in my hiking trips I have crossed many streams and rivers. Even so, you don’t get the same appreciation of water from these limited crossings as you do from canoeing or kayaking. Now being a canoeist as well as a backpacker, when on foot I feel I have a much more complete view of the landscape as a whole and how to properly negotiate terrain which contains water. I know the options and limitations. And I understand the power of water. To this end, I encourage all the outdoor leaders and aspiring outdoor leaders who work with me to undergo this type of training, whether they are paddlers or not. Further, I think it makes sense for pretty much any outdoors person who spends time in environments that contain moving water to take a weekend to do this type of training. At the very least, for me this training of this kind sits right alongside remote area/wilderness first aid training. Recently, some of the team from Frontier Bushcraft and friends got together in Wales for a long weekend of canoeing. This is an annual gathering and if there are sufficient numbers we also like to offer a White Water Safety & Rescue course either directly before or after the long weekend. This year Stuart, “Spoons” and Amanda attended the WWS&R course with my good friend and colleague Ray Goodwin, who has been providing this training for many years. His breadth and depth of paddling experience in canoe and kayak adds an extra quality over and above the technical syllabus. 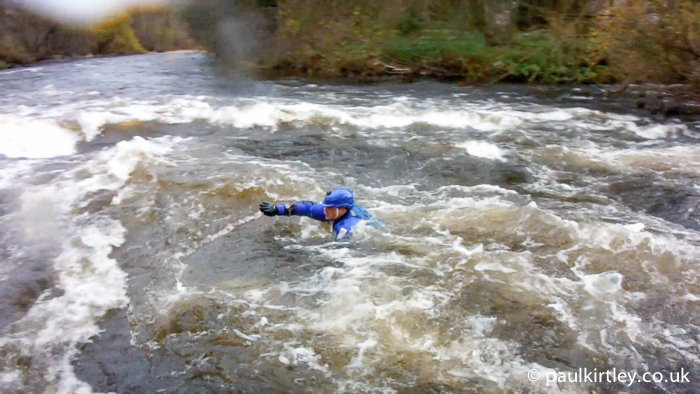 As well as river safety and rescue techniques, this was a course aimed at open canoeists (i.e. “Canadian canoeists”) so we also covered techniques specific to rescuing open boats. I recorded a video of the safety and rescue training which demonstrates the value of these techniques. 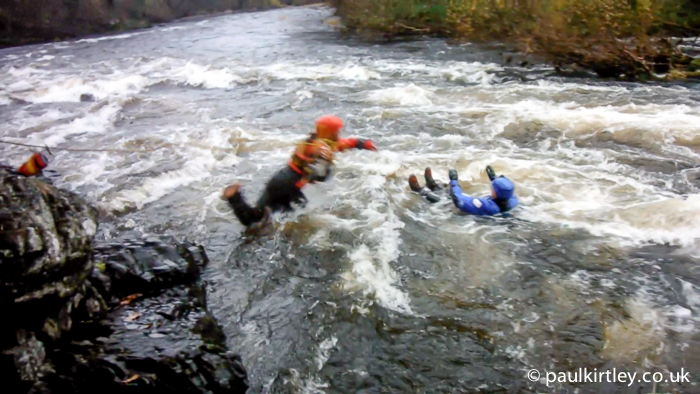 The canoe-specific rescue techniques are not included in the video as I wanted to demonstrate the universality of what was covered. Indeed, the group on this WWS&R course, though small, had quite a wide spread of experience in open canoes. Amanda has been paddling for a number of years now and has paddled with me in Algonquin Provincial Park, The French River and The Bloodvein River in Canada as well as on various trips in the UK. Spoons has been assisting Ray and I on our Expedition Canoeing Skills courses in the Lake District for the past few years, and while this is a flat-water course it has provided him with a good foundation, which he is now rapidly extending to include moving water paddling skills with a River Spey trip under his belt and having acquired his own canoe. On the other hand, Stuart is a relative newcomer to paddling on moving water. Regardless of this spread in experience, all were able to apply the techniques shown in the film and gained a lot from doing so. We also had a great deal of fun. Check out the film above for some voyeuristic pleasure as we throw ourselves repeatedly into increasingly fierce water. Amanda feels the full force of the water while on a rescue harness. Photo: Paul Kirtley. We followed the WWS&R training with four days of canoeing on lakes, canals and rivers, which really provided some good quality experience for all those who attended. Saturday and Sunday were the best attended days for obvious reasons but the conditions were not easy. Strong westerly winds made Ray and my life challenging, particularly on Sunday when leading the group on a section of the Dee. Then heavy rain brought rising water levels on Monday and Tuesday. Ray’s intimate knowledge of all the possible venues in his area of Wales made the weekend a success despite the conditions. The WWS&R skills also came in handy on a number of occasions. The three in the group who had just trained for first time in these skills quickly saw their value in action being applied in real world situations. One such instance is shown at the beginning of the video embedded above. Really enjoyed watching this well-edited video Paul. Gives a good idea of what is involved in setting up these kinds of rescues. 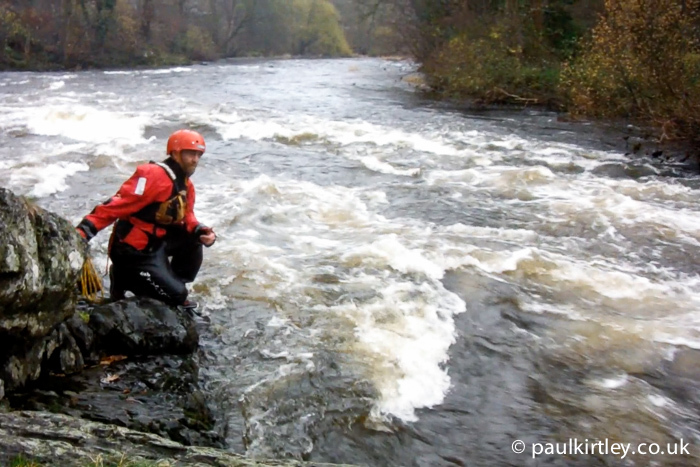 This course was a turning point for me, as most of my activities are land based, I had only briefly dabbled in white water, and feared it rather than respected it I guess. Though after some quality tuition and plenty of swimming I now see moving water in a completely new light, understanding its components rather than just seeing it as a big picture. I now strongly recommend this course to anyone operating near or on water. Chris and the Staff of Leicester Outdoor Pursuits Centre. My sentiments exactly Chris, a couple of days of quality instruction has completely changed the way that I view fast water, it’s now something to be respected rather than feared. And it’s really good fun too! It’s good to hear you are on exactly the same page. Great vid Paul, well done to the team on that lot! Thanks for your comments. And you highlight a good point about outdoor leaders and instructors needing to train and refresh their skills. You can never sit on your laurels. Having done this course myself it was great to watch this video. I definitely want to do a refresher. Great video Paul and hats off to Amanda for giving permission to keep in the part where she was upset. As we all know, water can take life – her personal experience of a near-drowning really emphasised the point. These skills are essential for those of us who spend time around moving water. Well done guys. Hopefully I’ll join you next year! Although I have not done canoe rescue I am qualified as a Swift water Rescue Technician (SRT) and have been involved in teaching skills for a couple of years. If you don’t have the skills, team and equipment to hand there is little you can do but be a bystander to a potential tragedy. I do have a couple of questions about the video, is there a less public way that I can ask them? Thanks for your comments. It’s good to hear from others who understand the value of these skills. You are right about the kit for many situations, although I have heard several stories where people who had the skills and training but not the kit to hand did improvise in some way to help avoid a potential tragedy. I see you have sent me an email so I will answer you that way. One of the questions I will have to refer to Ray Goodwin. Thank you both for the prompt replies. It is fascinating to see both the similarities within the two disciplines, along with the differences. The thing I found most interesting with my training is that I didn’t realise how important the skills were until I had them. I would recommend some level of training to anyone who spends time around the water, be it canoeing or fishing. Come the new year I shall be signing up for your expedition canoeing skills course so I look forward to meeting both of you. Good to hear back from you again and to have discussed the finer points offline. With respect to the Expedition Canoeing Skills Course, there is currently only one place left across both courses. Would you like me to reserve it for you? Hi Paul! Good and fun article. 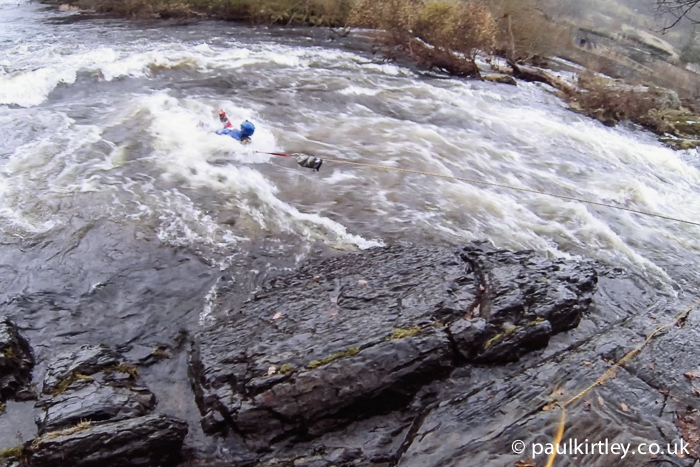 Did not know if you folks had much white water in the UK area. I guess i have been spoiled here in the US with many great adventures on the water. Was wondering if you knew they make a Blue Water water rescue rope now… Designed for water rescue. Could not tell from the pictures what kind of rope you were using. Whether it was static or dynamic or one designed for water rescue use.. Any way enjoy your articles and appreciate your emails!! The latter is the more heavy duty of the two. Whereabouts in the US are you based/do you paddle? Hi! Yes I do! And many other out door adventures!! I have lived in Idaho and California and Michigan and now in Nebraska. I like the throw bags. Also don’t forget the good old fashioned Coast Guard Ring with rope handles on them. If some one has been in the water for very long it is hard to grasp and hold onto a lot of things, people included. But the ring you can hook your arm in or wrap both around it. The extra flotation gives a boost of relief to the person being rescued as well!! Any way learned alot watching the video!! Of Coarse not available in US… I will look for other distributors or comparable make… But it is water line and flotation!! Very nice!! well done to all, that sort of training takes real courage ! have a very happy, and dry, Christmas. Hey John, good to hear from you. Have a great Christmas and we look forward to seeing you again before too long. Glad you enjoyed it Peter. Yes, that’s a good point. You certainly want to have these skills sorted before you have to try them. Not something you’d likely make up as you went along. Great video, Paul! I would love to learn these skills, too! Really cool! I watched it from beginning to end. Very good stuff. I wonder if they taught you how to cross a river with walking sticks. I learned it in the Andes Mountains, Argentina after I nearly fall (with potential deadly results) trying to cross a little but powerful stream up there. Since I am a lot more cautious about running water. Thanks for your comment. I’m glad you enjoyed the video 🙂 I tried to make it entertaining as well as informative. We didn’t do the walking stick crossing technique on this course but it’s something covered in our Mountain Leader training over here. My colleague James Bath has also written a series of articles on crossing water, more from a hikers perspective than a canoeists perspective. They are on my bushcraft shcool’s blog and I have linked them below for easy reference. You are definitely right to be wary of moving water. I wold swim like you guys! But It scary! How you don’t afraid the rocks under water? Oh, you definitely must keep your feet up, away from the rocks or the bottom of the river. And sometimes the boat flips? Is there any chance banging on the stone head?